You are here: Home / The Hunski Experience / Are the Woods That You Use Really Salvaged? How Do You Know? Are the Woods That You Use Really Salvaged? How Do You Know? How do you know for sure that the live edge wood slabs or lumber that you are using are truly salvaged material? If the companies that you get your wood from aren’t the actual people who take down the trees, then there is no way to know for sure if the tree truly needed to be taken down. With the terms “salvaged” and “urban lumber” being so popular right now, you will be hard pressed to find a company that says that their would products are anything but that. 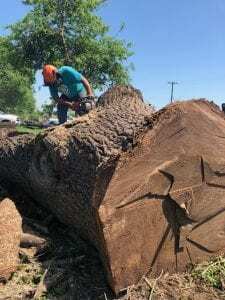 In reality, just in the Sacramento area there are lots of people who take out healthy living trees because they know that they can mill them into slabs and sell them as salvaged or sell them to companies in the area, down south, up north or back east who will label the wood as “salvaged”. We at Hunski Hardwoods pride ourselves in offering truly salvaged wood products. We ensure this by being the actual people who talk to the tree owners, harvest the trees, mill them in house on our sawmills and dry and sell the wood. 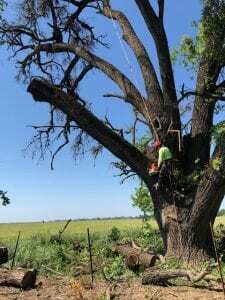 Most of the time we have pictures of the tree and removal process with the story behind the tree, so you can know for sure that the wood came from a tree that truly needed to come. We specialize in salvaging dead, dying, hazardous and unwanted trees. If you are looking at purchasing wood ask the questions: Why did the tree need to be taken down? 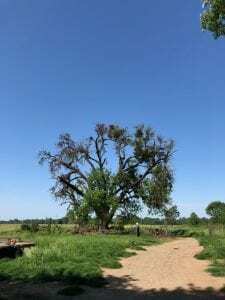 What was the story behind the tree? Do you have pictures of the tree while it was still standing? If their answers are short and brief like the tree was dead or it came from a retired orchard and they can not expand on it or have pictures then there is a good chance that they were not the ones who took the tree down and there is no guarantee that it is truly salvaged.